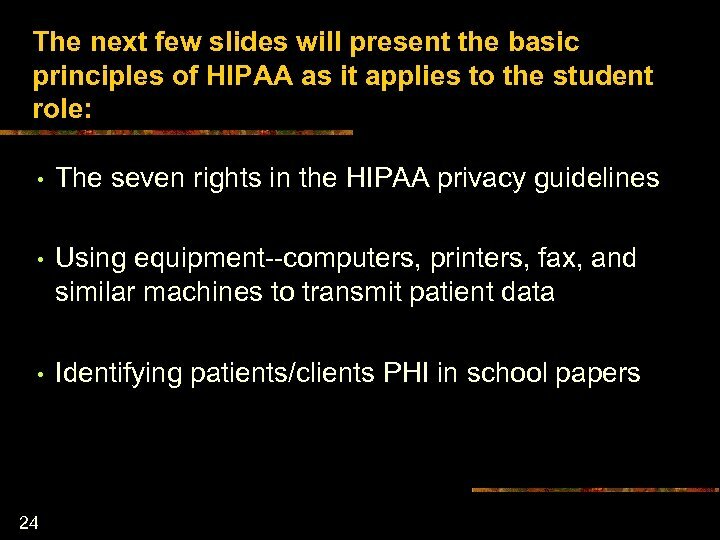 HIPAA regulations were designed to: n n n 5 Protect individuals’ rights to privacy and confidentiality and Assure the security of electronic transfer of personal information The first…protecting privacy and confidentiality rights, is the subject of this instructional program. 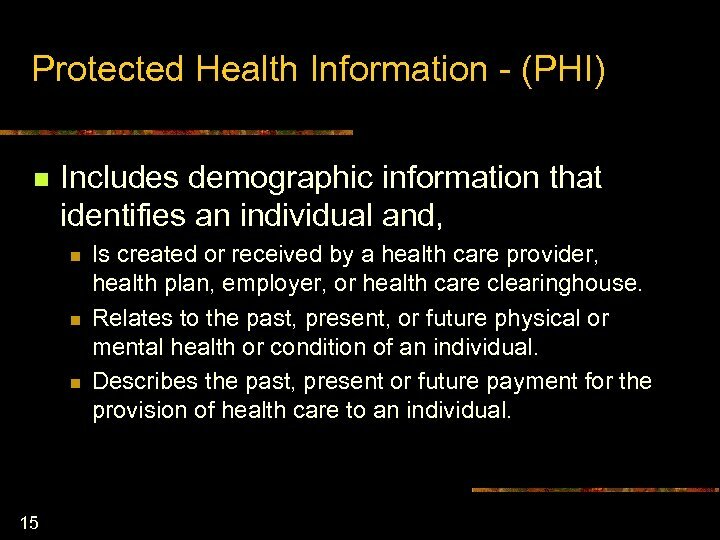 Protected Health Information - (PHI) n Includes demographic information that identifies an individual and, n n n 15 Is created or received by a health care provider, health plan, employer, or health care clearinghouse. Relates to the past, present, or future physical or mental health or condition of an individual. 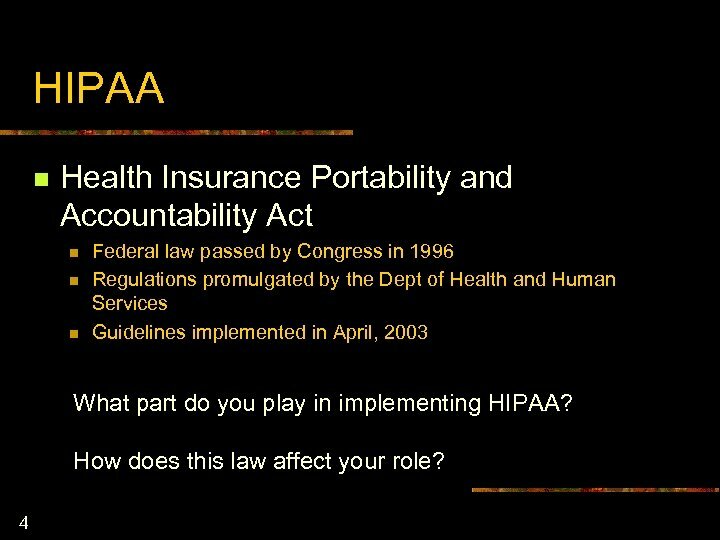 Describes the past, present or future payment for the provision of health care to an individual. 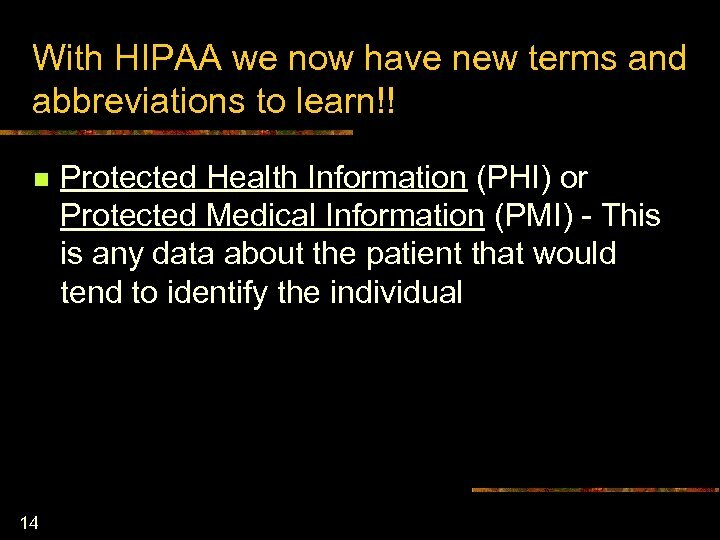 With HIPAA we now have new terms and abbreviations to learn!! 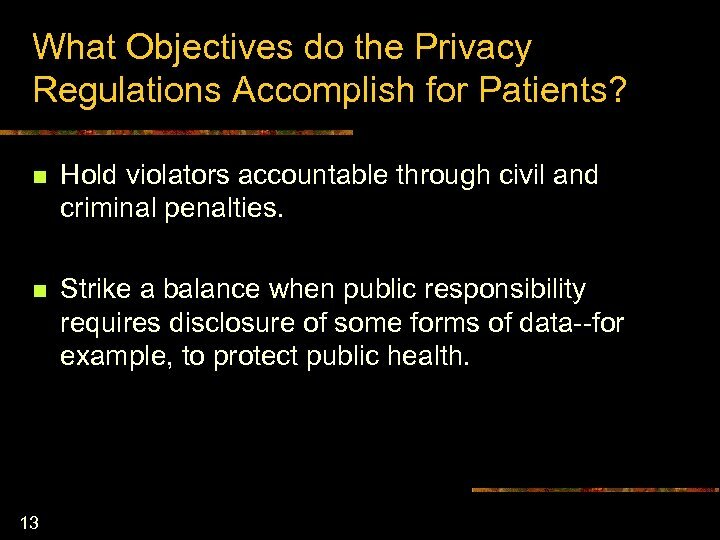 n 17 Privacy Officer (PO) - Each facility will have an employee who is responsible for implementing and enforcing this law. 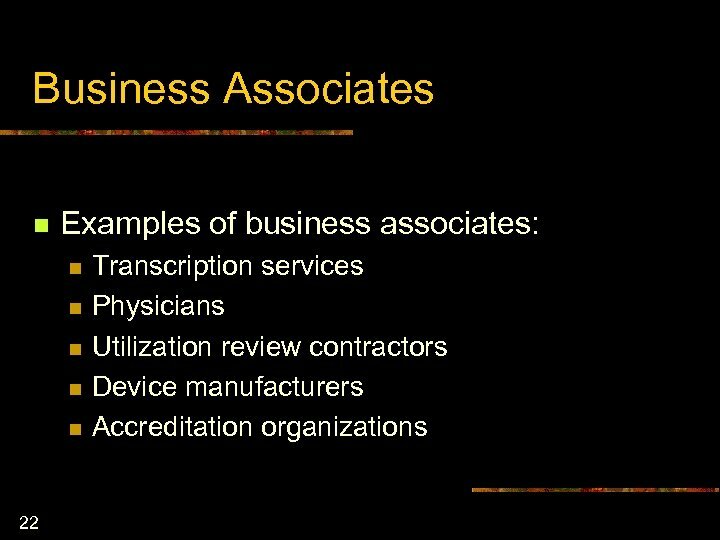 Some may have one over a multi-facility network, others one at each site. 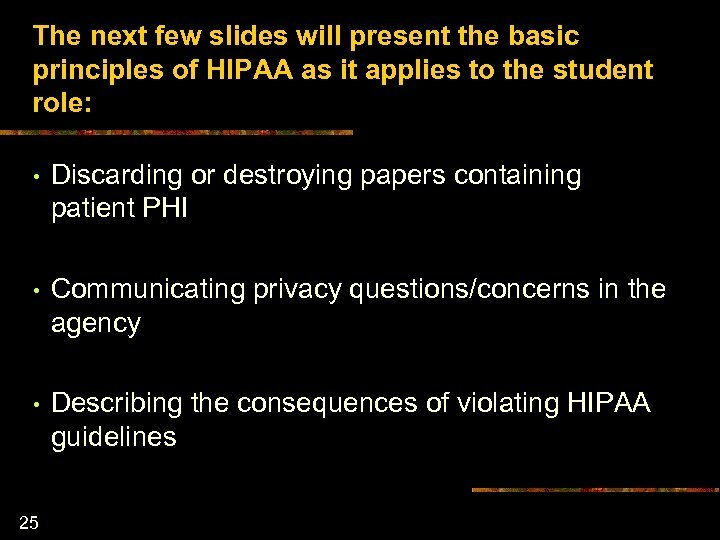 As an occupational therapy student this individual (after your fieldwork educator) could be your point of information regarding HIPAA. 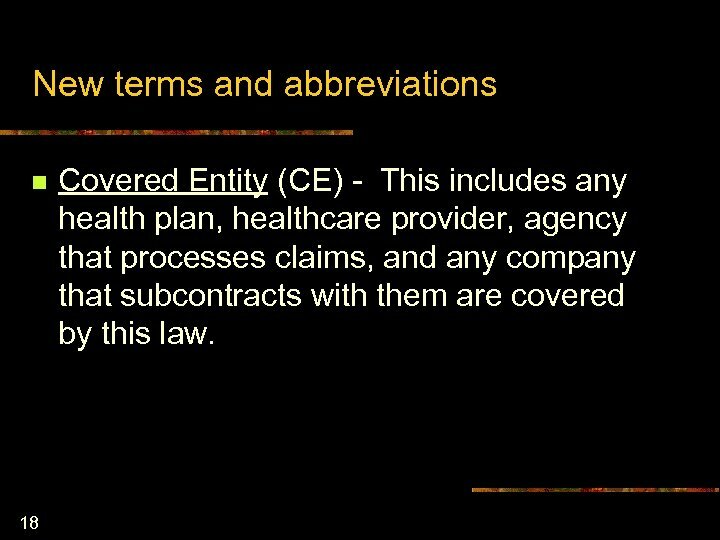 New terms and abbreviations n 18 Covered Entity (CE) - This includes any health plan, healthcare provider, agency that processes claims, and any company that subcontracts with them are covered by this law. 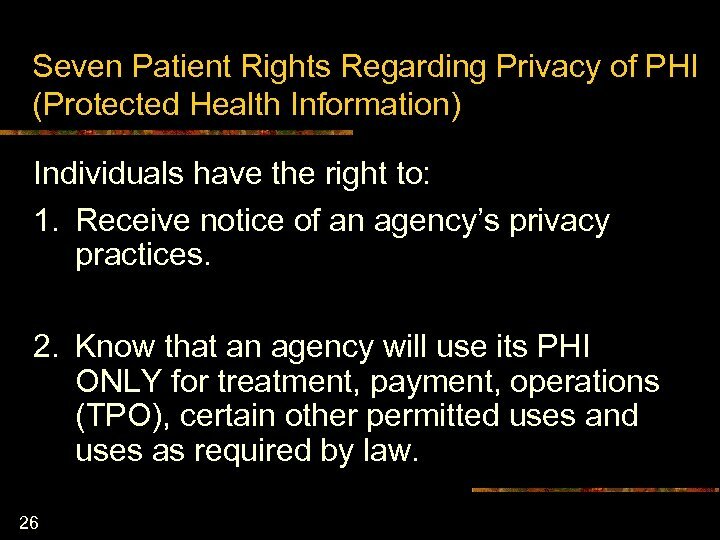 HIPAA Restricts Sharing PHI Personal information cannot be released to individuals or companies interested in marketing ventures, without the patient’s written permission. 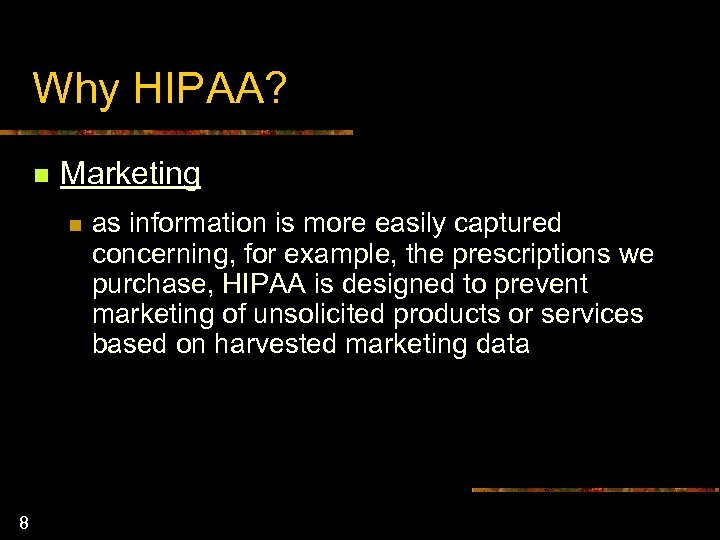 For example: n n n 29 Names of patients on antihypertensive drugs cannot be released to a company marketing nutritional products to lower blood pressure. 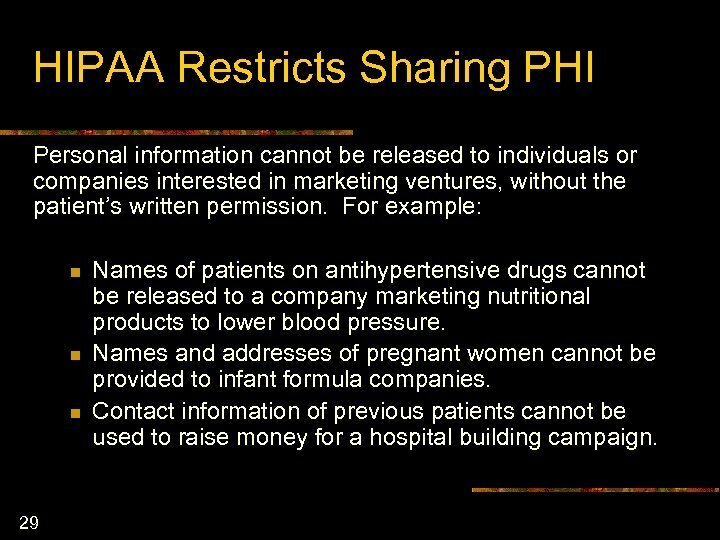 Names and addresses of pregnant women cannot be provided to infant formula companies. 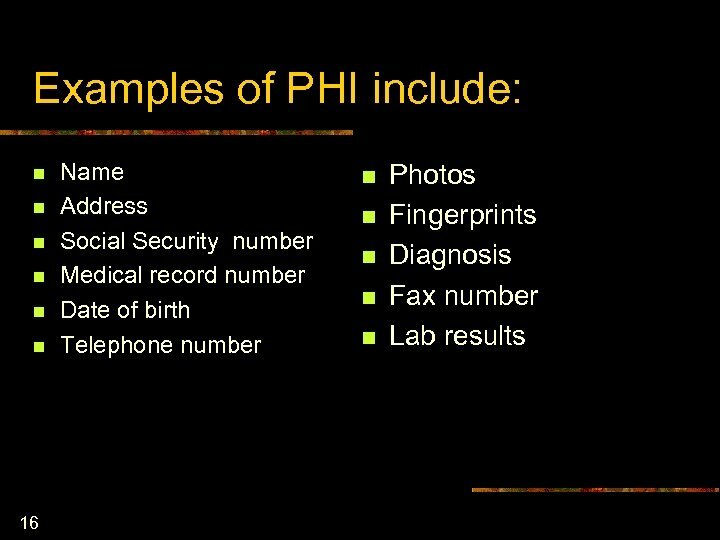 Contact information of previous patients cannot be used to raise money for a hospital building campaign. 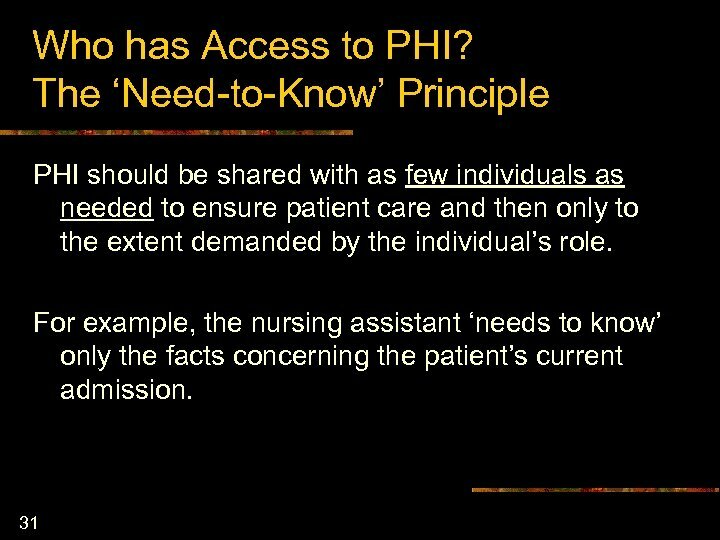 Protecting your patient’s PHI n Take all reasonable steps to make sure that individuals without the ‘need to know’ do not overhear conversations about PHI. 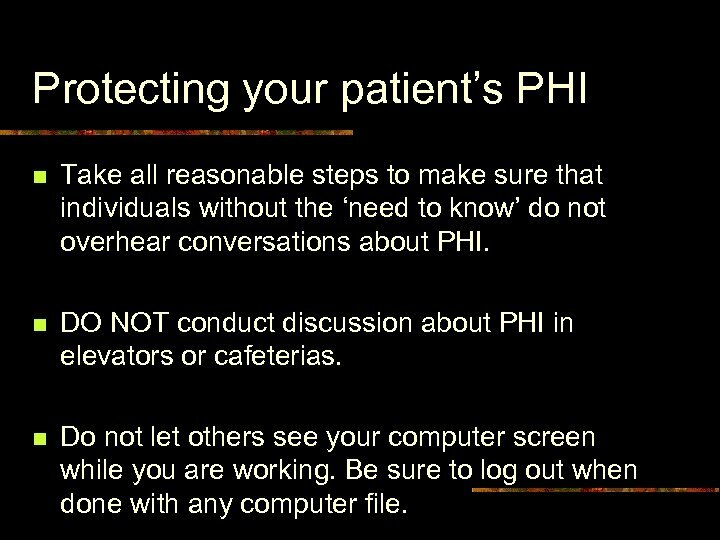 n DO NOT conduct discussion about PHI in elevators or cafeterias. 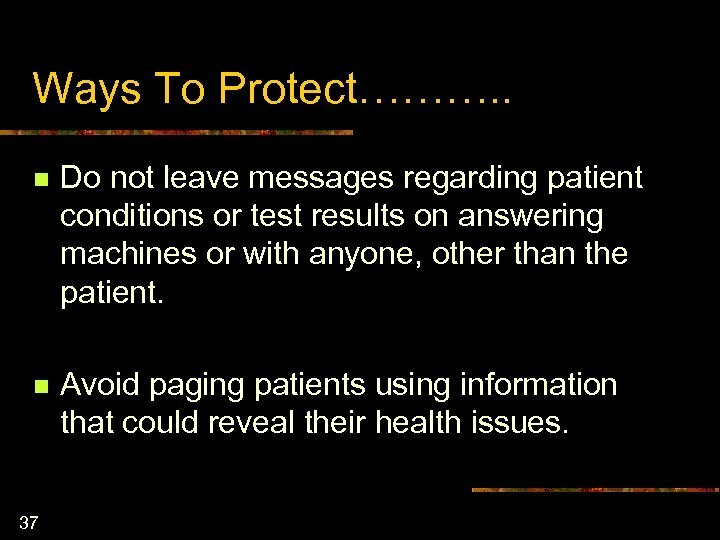 n Do not let others see your computer screen while you are working. 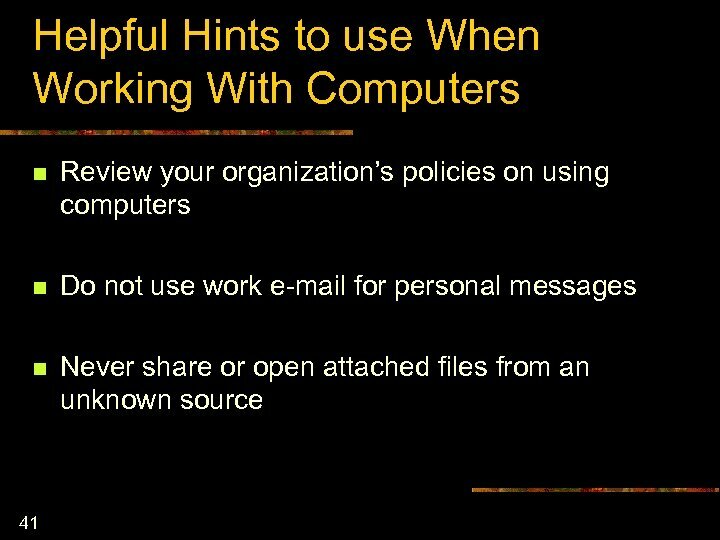 Be sure to log out when done with any computer file. 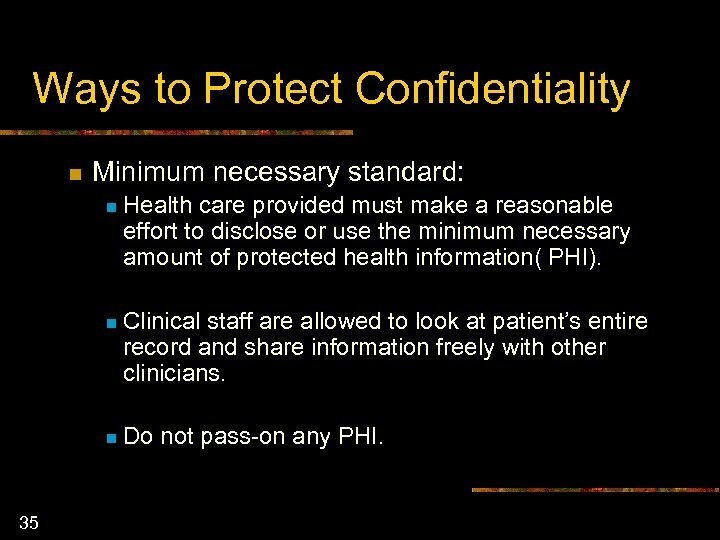 Ways to Protect Confidentiality n Minimum necessary standard: n n Clinical staff are allowed to look at patient’s entire record and share information freely with other clinicians. 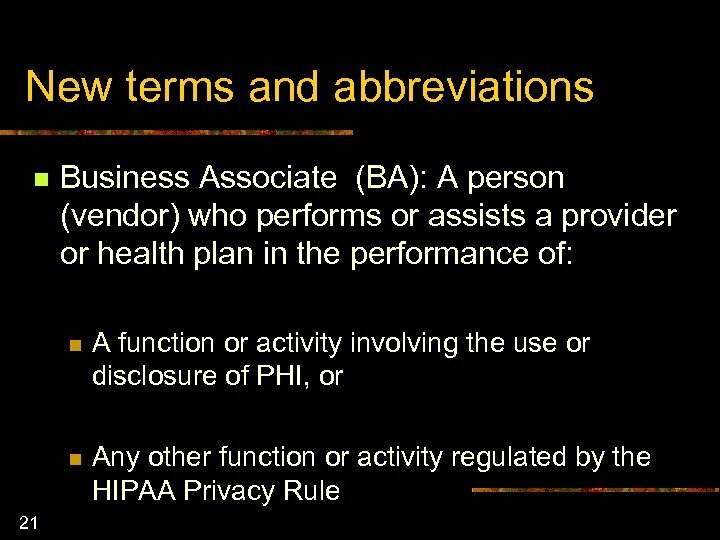 n 35 Health care provided must make a reasonable effort to disclose or use the minimum necessary amount of protected health information( PHI). 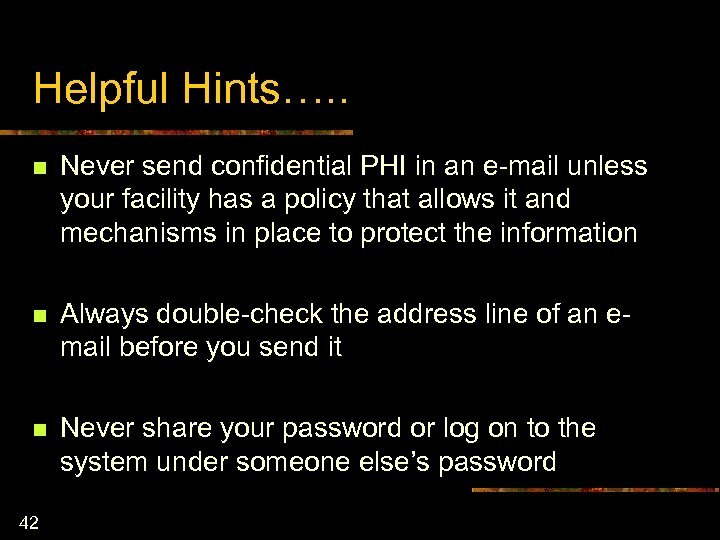 Do not pass-on any PHI. 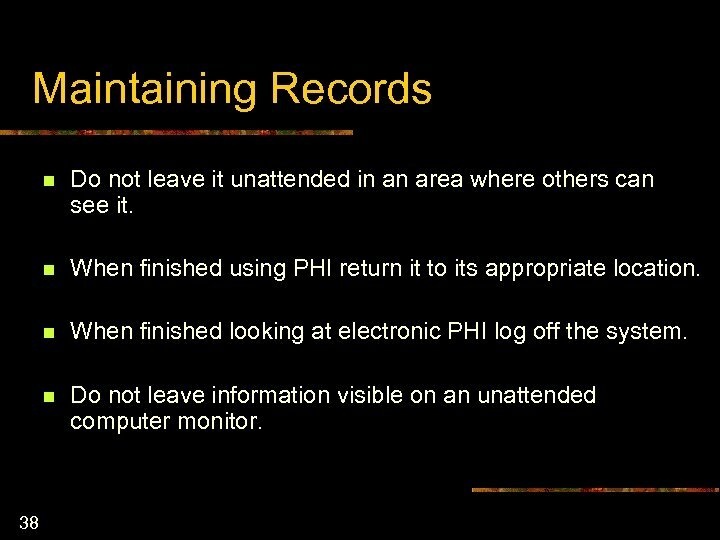 Maintaining Records n n When finished using PHI return it to its appropriate location. 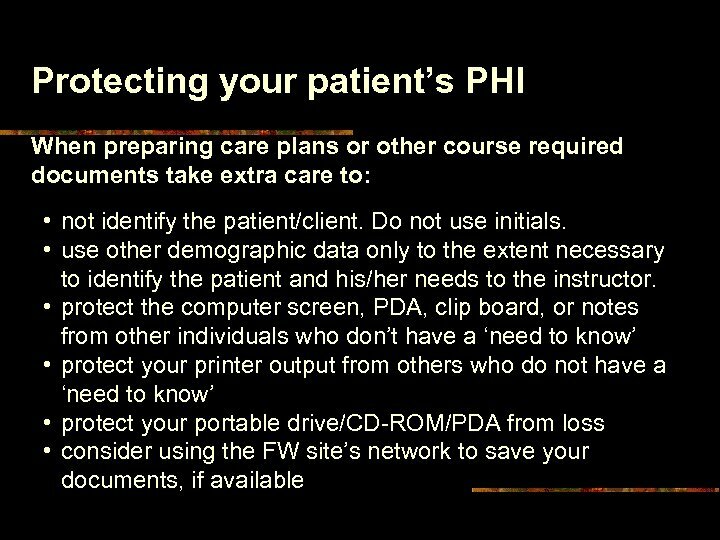 n When finished looking at electronic PHI log off the system. n 38 Do not leave it unattended in an area where others can see it. 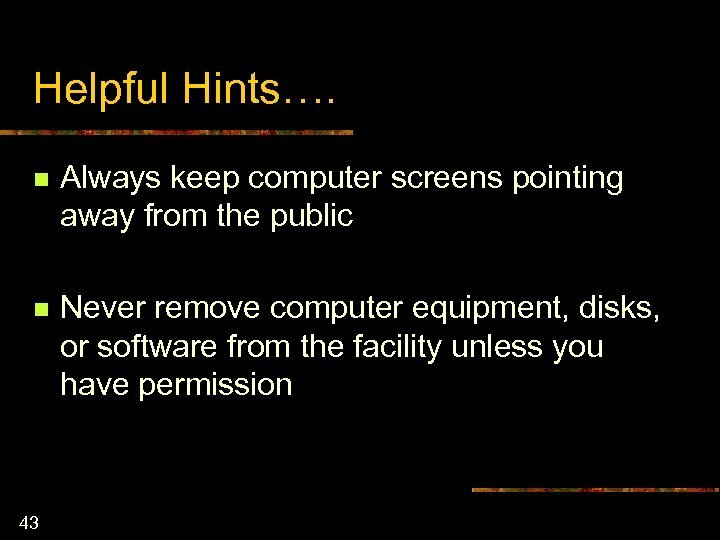 Do not leave information visible on an unattended computer monitor. 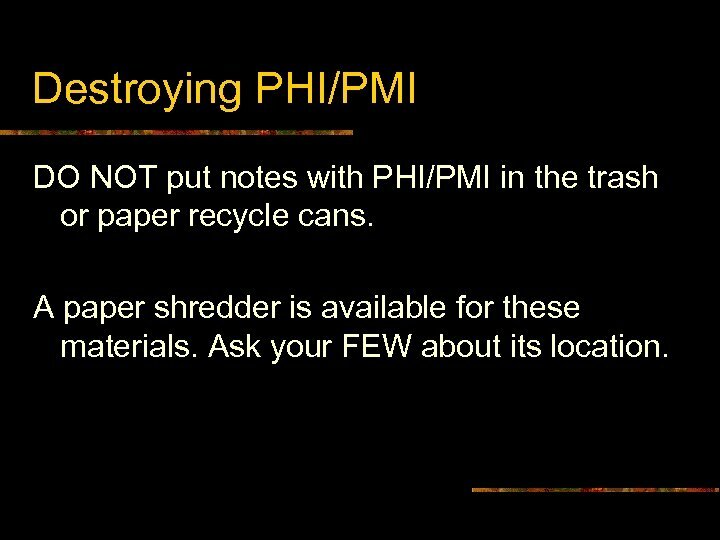 Destroying PHI/PMI DO NOT put notes with PHI/PMI in the trash or paper recycle cans. A paper shredder is available for these materials. 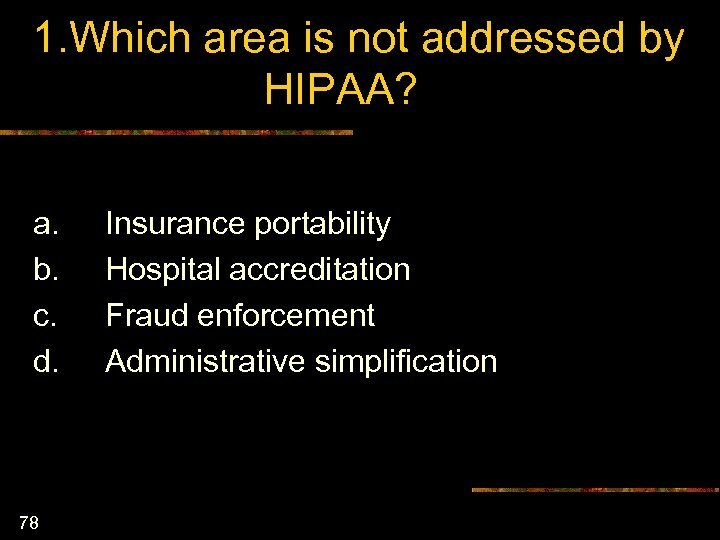 Ask your FEW about its location. 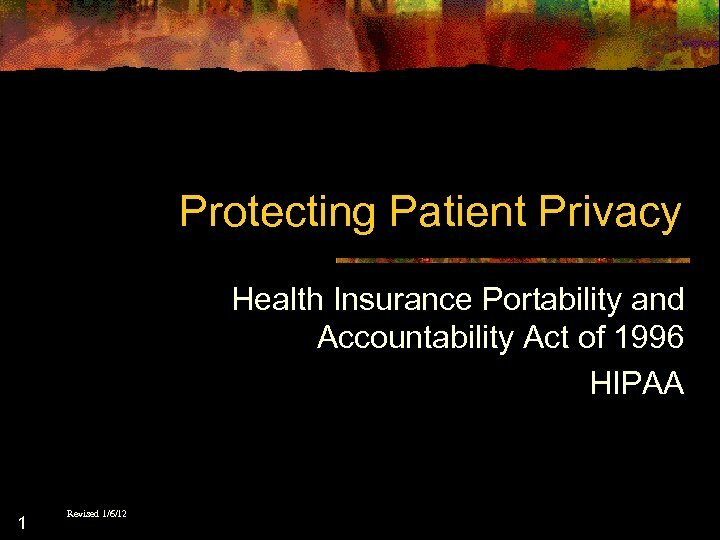 Enforcement n Breaking HIPAA privacy or security rules can mean either a civil or a criminal sanction: n n Gaining access to PHI under false pretenses can result in a five-year jail sentence and a $ 100, 000 fine. 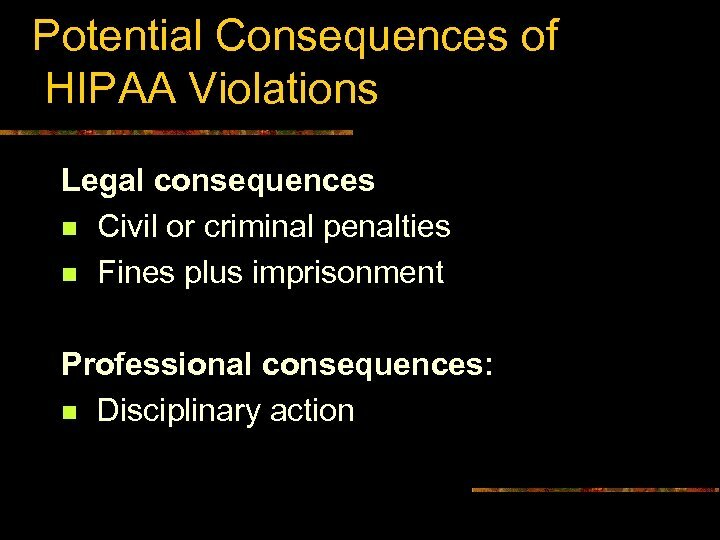 n 50 Knowingly releasing PHI can result in one-year jail sentence and $ 50, 000 fine. 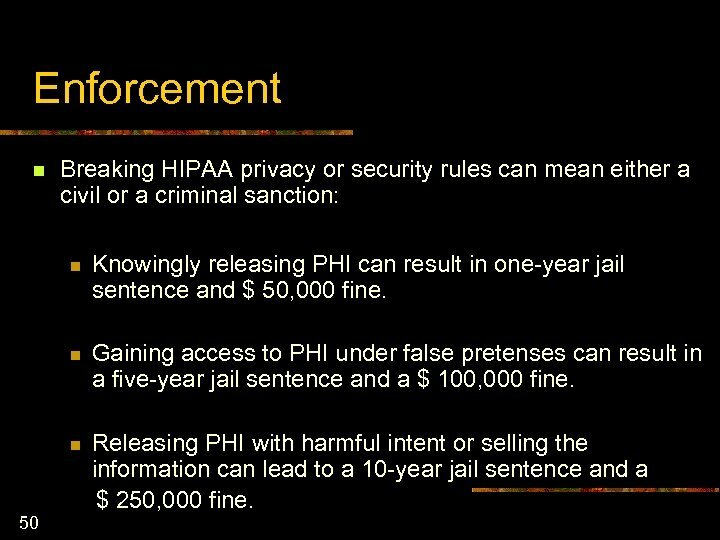 Releasing PHI with harmful intent or selling the information can lead to a 10 -year jail sentence and a $ 250, 000 fine. Resisting the Need to Share PHI—Honoring the Patient’s Right to Privacy Johnny, an active 4 year old, breaks his arm after falling from a climbing form at his daycare. 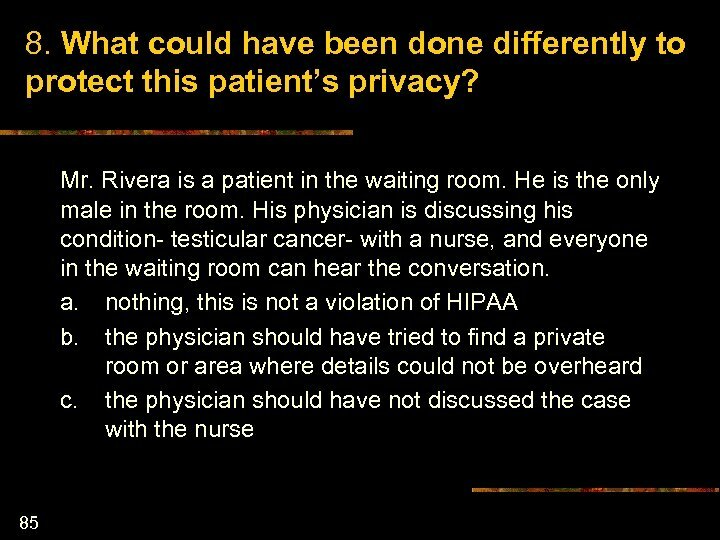 As the OT caring for him after the removal of the cast, you know that he is HIV positive. Your daughter attends the same daycare. You alert some of the other moms at that center. 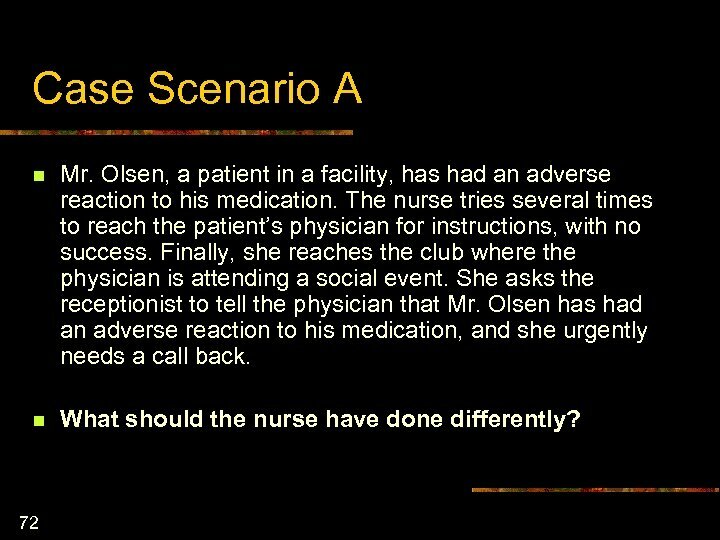 What’s wrong with this scenario? 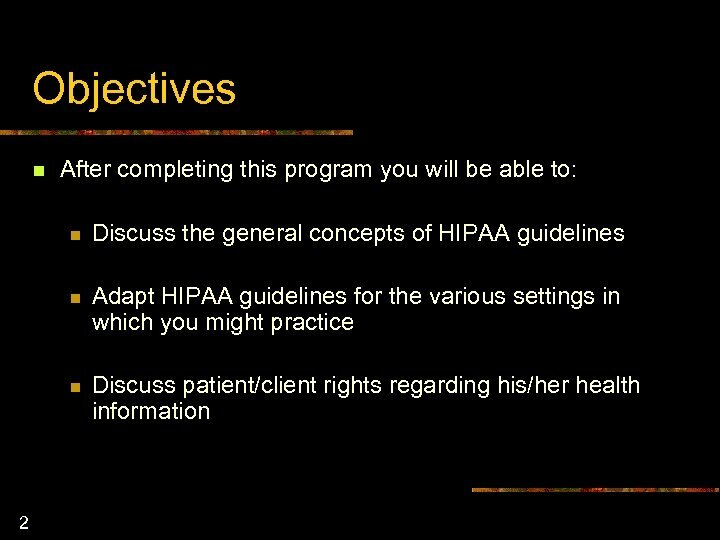 Who in this setting has a ‘need to know’ the HIV status of this child? 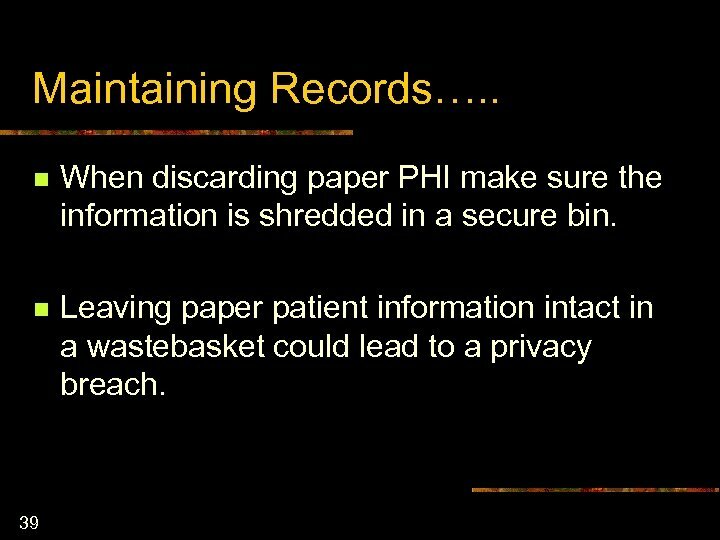 You see some patient’s data in the trash can. What should you do? A. Remove it and take it to the document shredder. B. 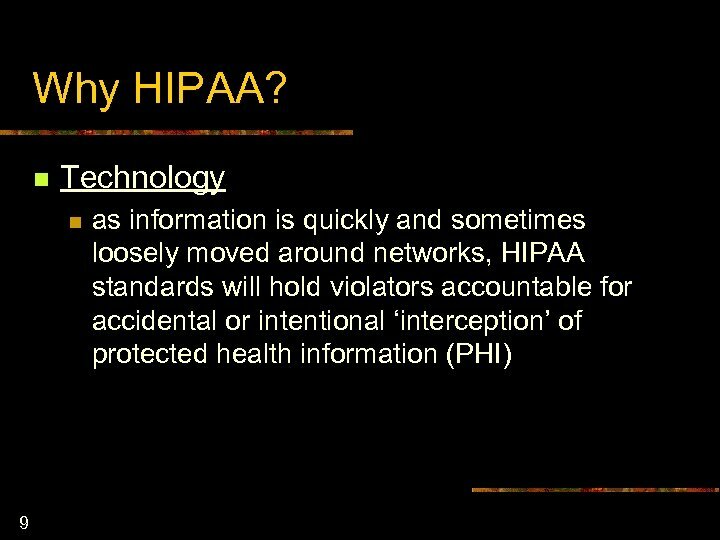 Report it to the Agency’s HIPAA officer. 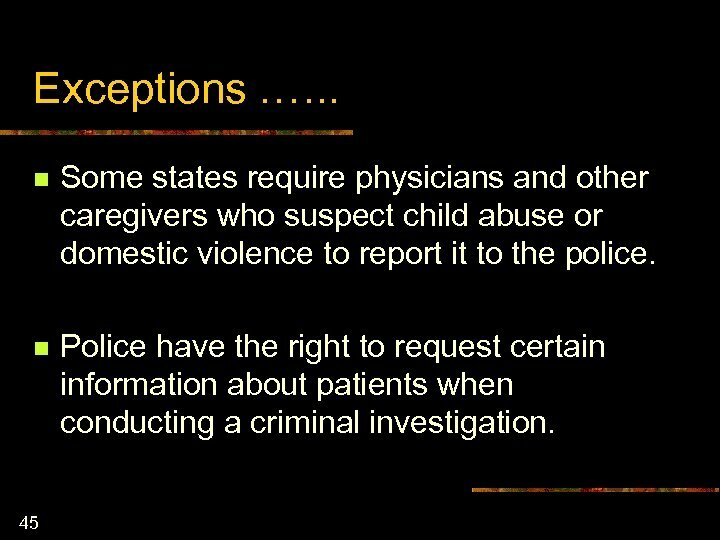 C. Call the toll-free number and make an anonymous violation report. 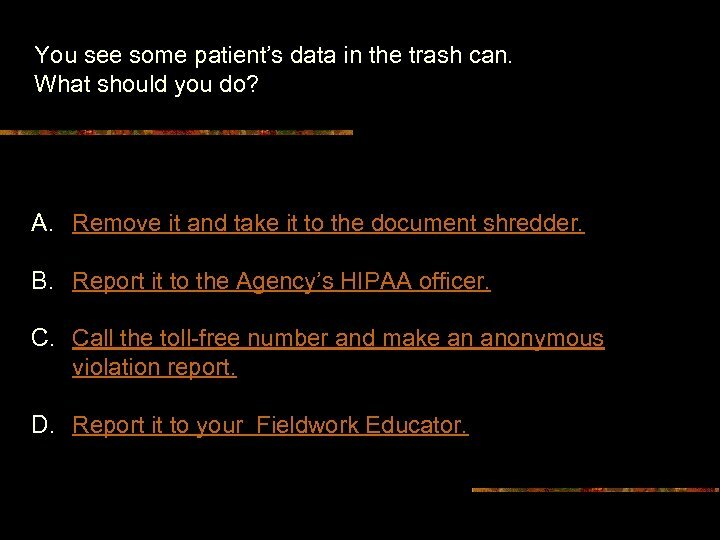 D. Report it to your Fieldwork Educator. 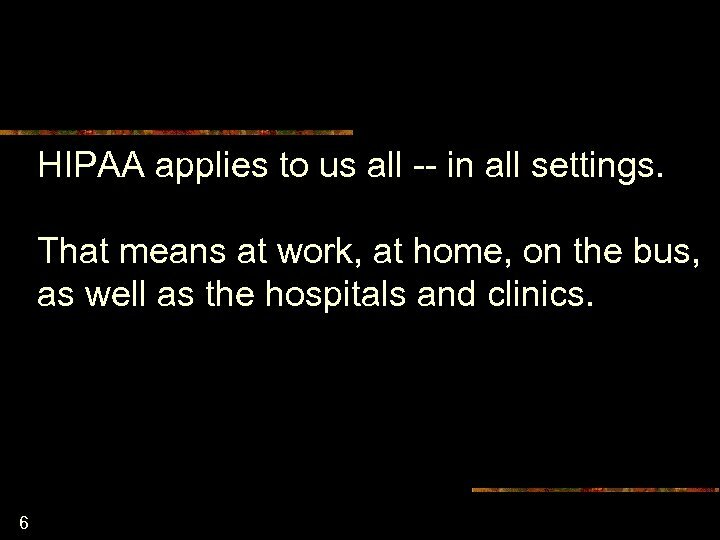 If you answered “A”… A. 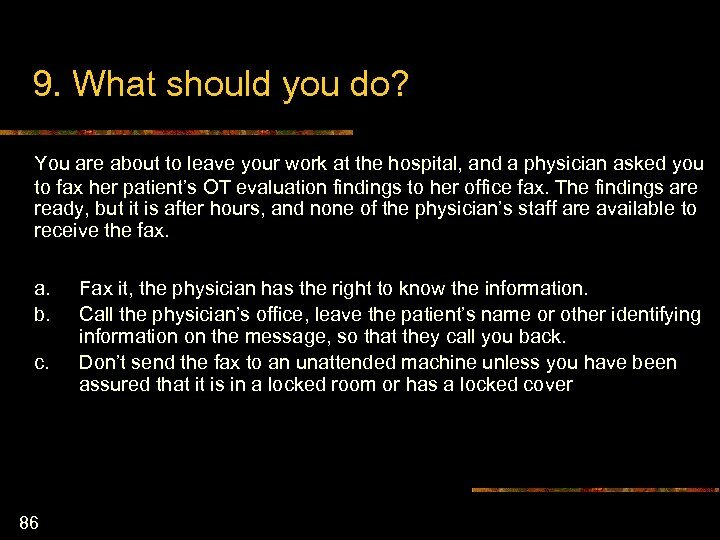 Remove it and take it to the document shredder. No, this is not the best response. 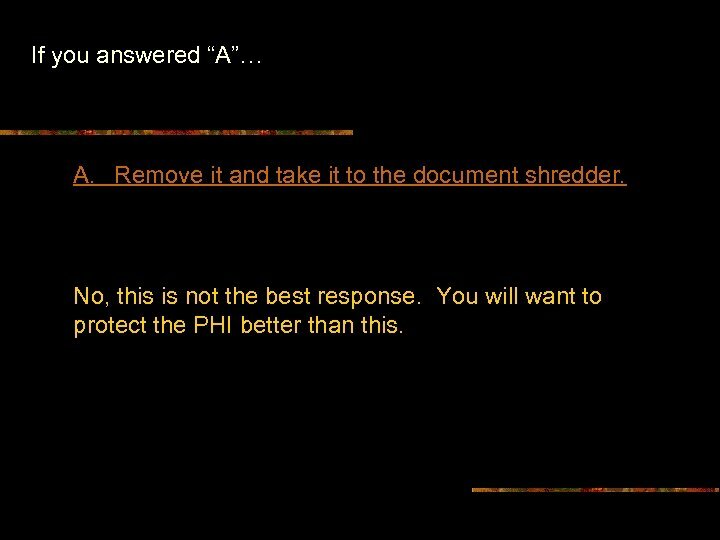 You will want to protect the PHI better than this. 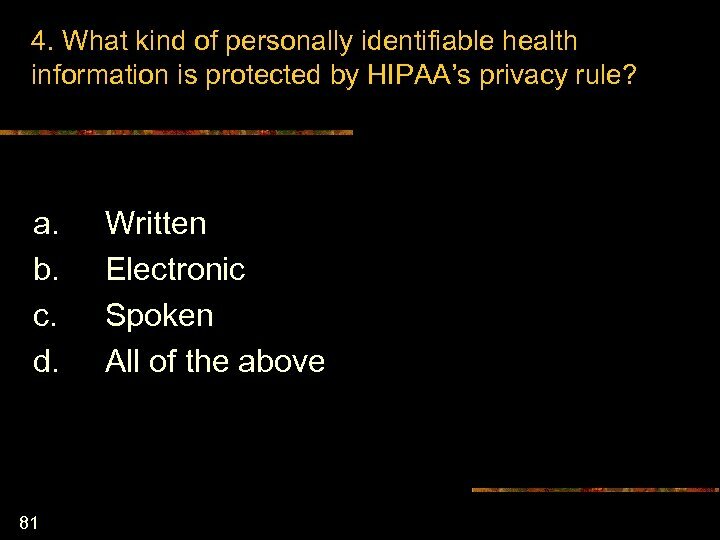 If you answered “B”… B. 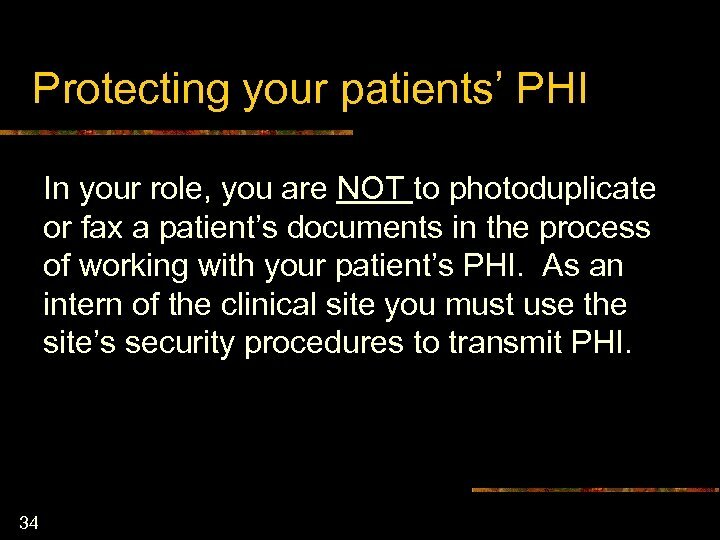 Report it to the Agency’s HIPAA officer. Well…this is an option, but maybe over-kill at this stage. You should tell your FWE. He/she will make sure that the individual responsible gets further education. 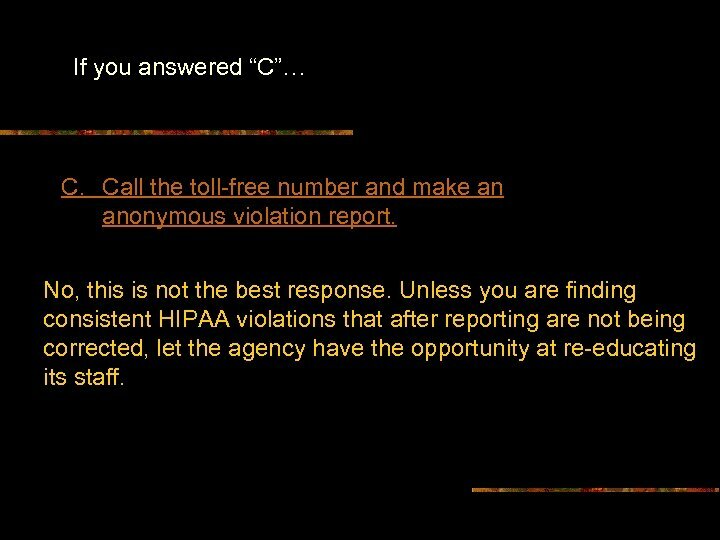 If you answered “C”… C. Call the toll-free number and make an anonymous violation report. No, this is not the best response. 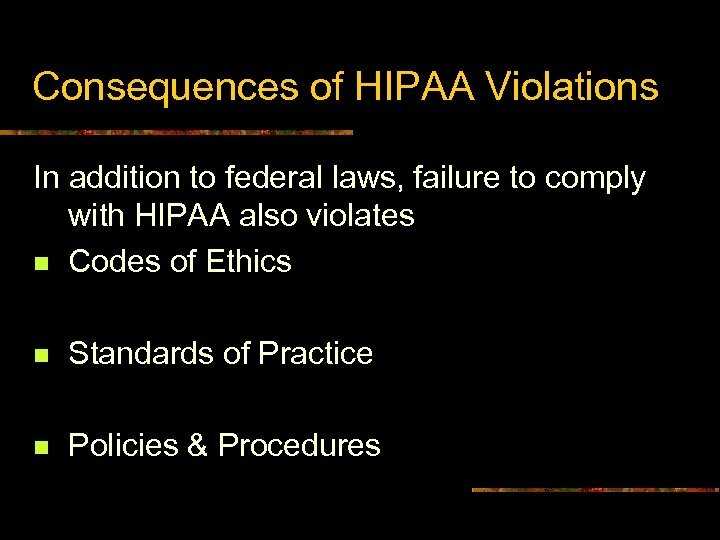 Unless you are finding consistent HIPAA violations that after reporting are not being corrected, let the agency have the opportunity at re-educating its staff. 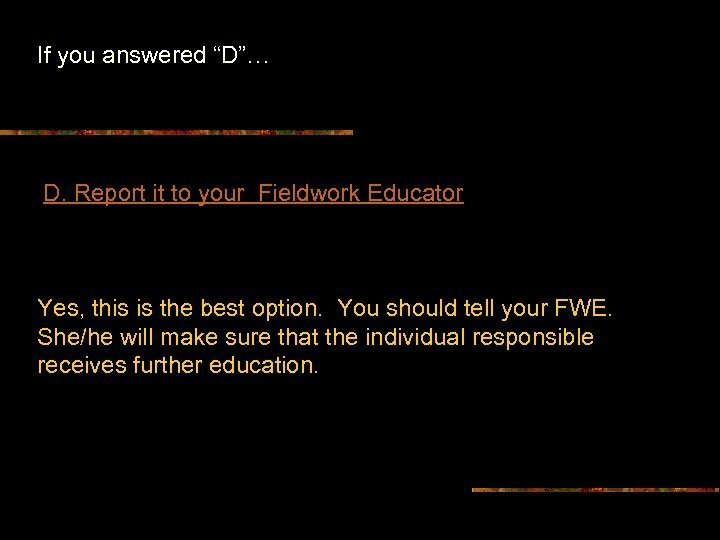 If you answered “D”… D. Report it to your Fieldwork Educator Yes, this is the best option. You should tell your FWE. She/he will make sure that the individual responsible receives further education. 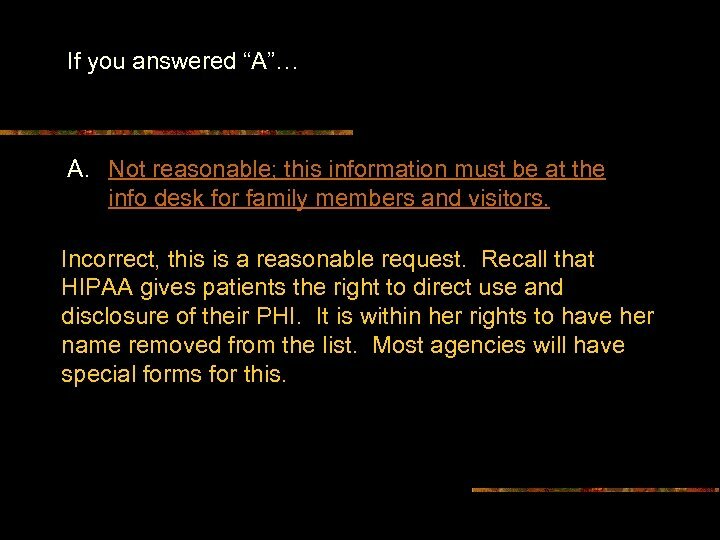 If you answered “A”… A. 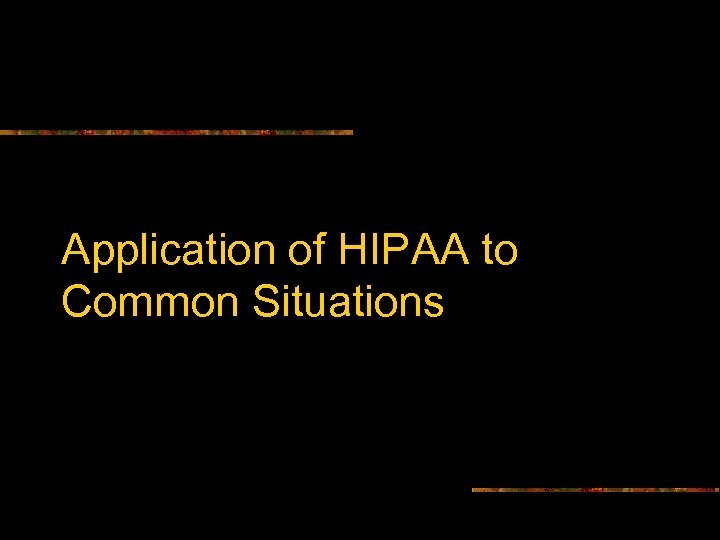 Remind her of HIPAA and tell her that you should not discuss this type of information. Yes, this is a good option. 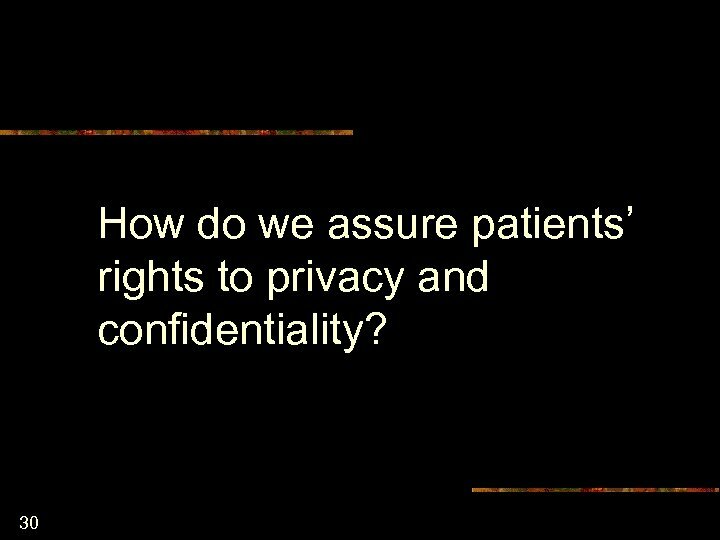 Help her recall her responsibilities to the patient’s right to confidentiality and privacy. 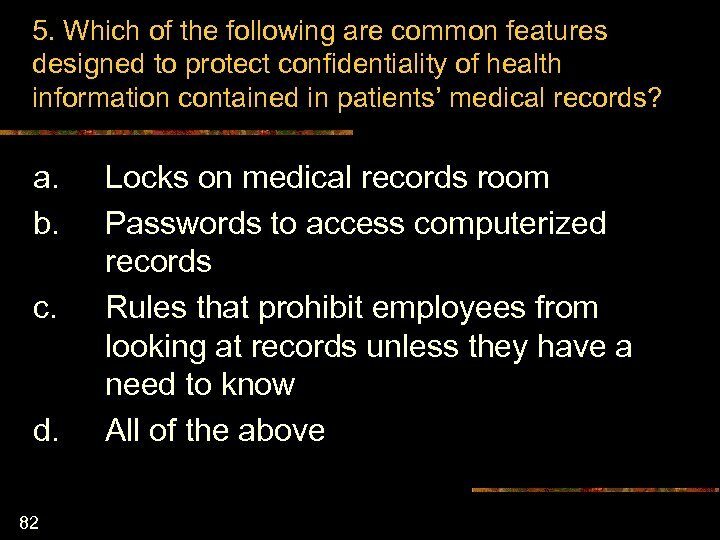 If you answered “B” or “C”… B. Ask her how old he is. 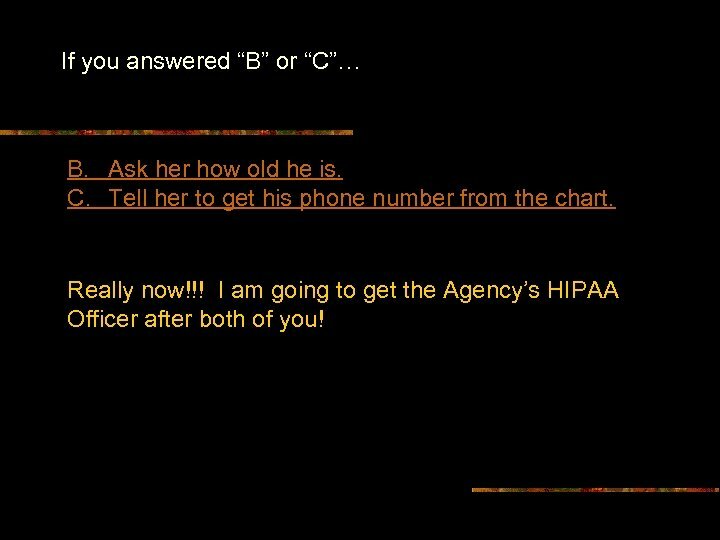 C. Tell her to get his phone number from the chart. Really now!!! 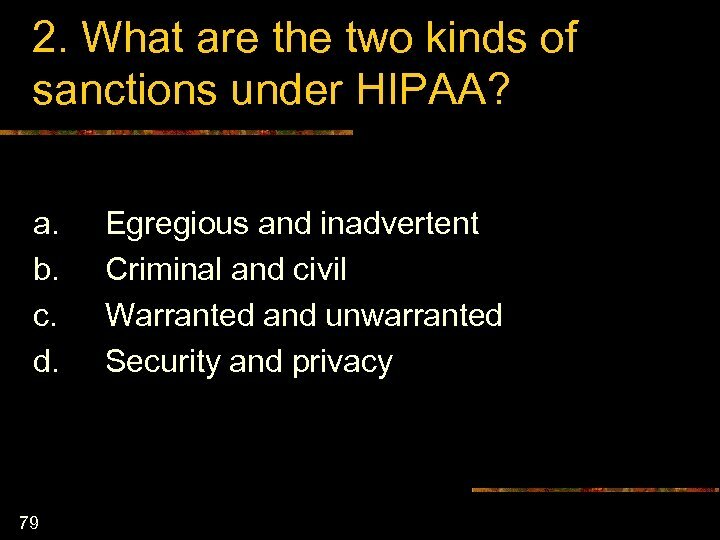 I am going to get the Agency’s HIPAA Officer after both of you! 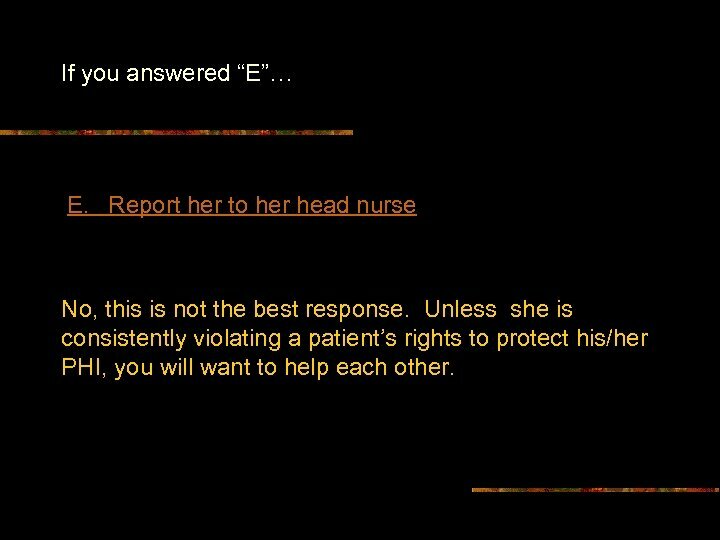 If you answered “E”… E. Report her to her head nurse No, this is not the best response. 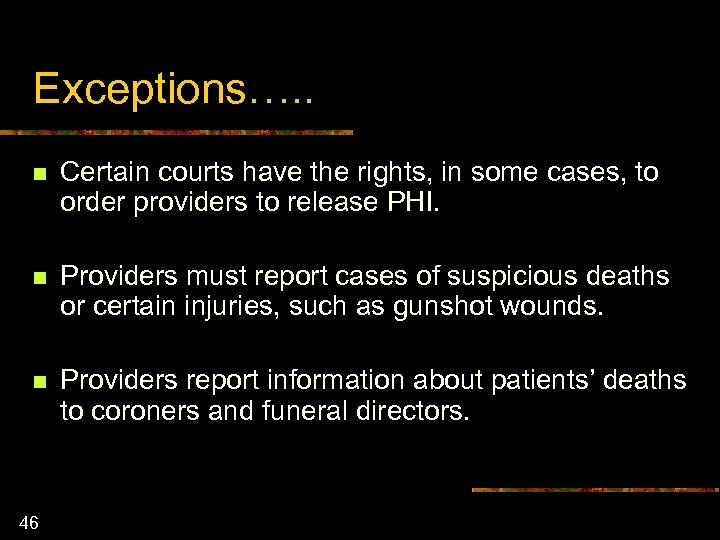 Unless she is consistently violating a patient’s rights to protect his/her PHI, you will want to help each other. 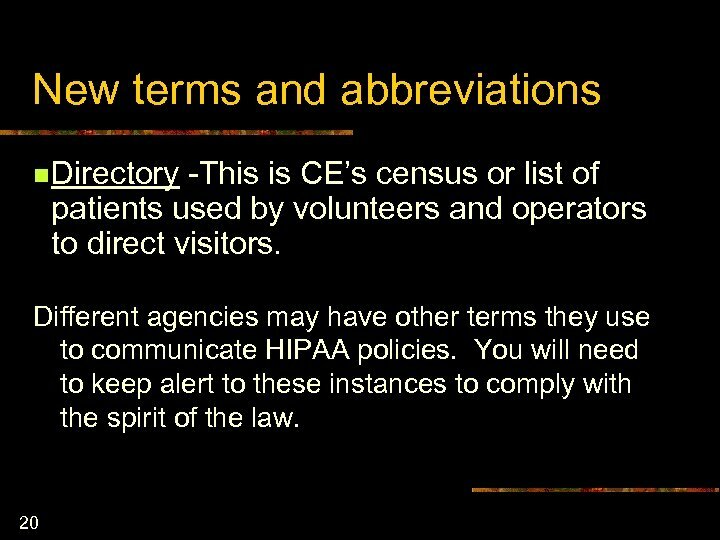 While assisting Mrs. Johnson with her bath, she tells you that she would like to remove her name from the patient data that the volunteers have at the reception desk. Is this a reasonable request? What would you do with this request? A. Not reasonable; this information must be at the info desk for family members and visitors. B. Reasonable; report it to your FWE. 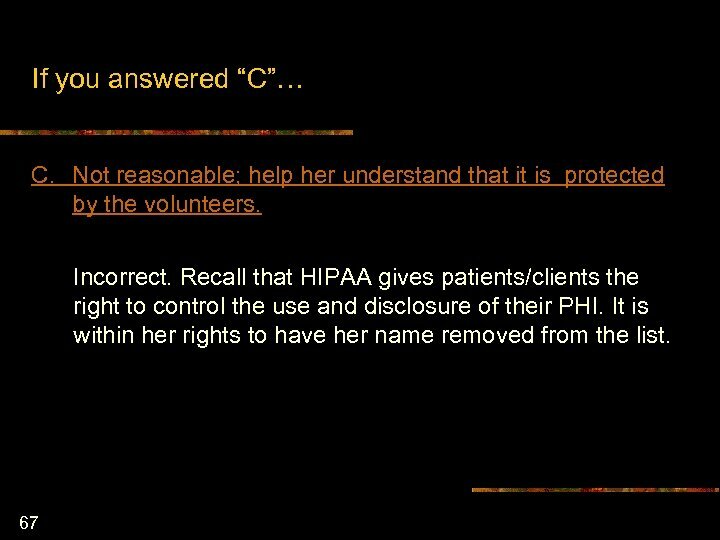 C. Not reasonable; help her understand that it is protected by the volunteers. D. Reasonable; call the volunteer office and have her removed from the list. 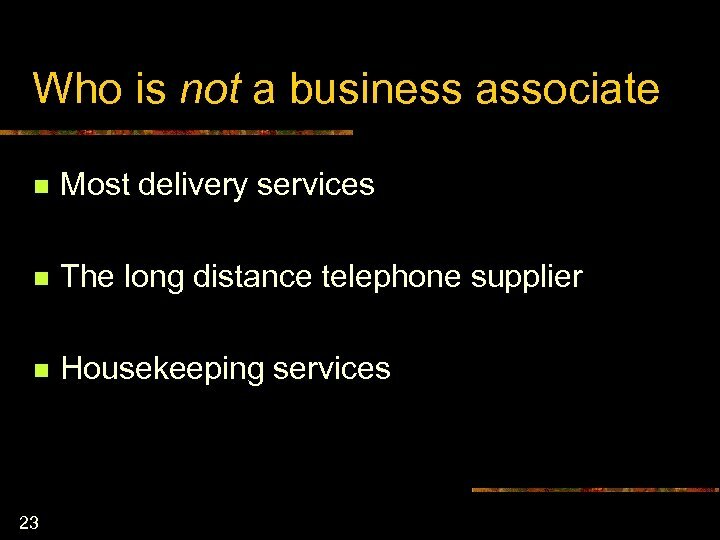 If you answered “A”… A. Not reasonable; this information must be at the info desk for family members and visitors. Incorrect, this is a reasonable request. 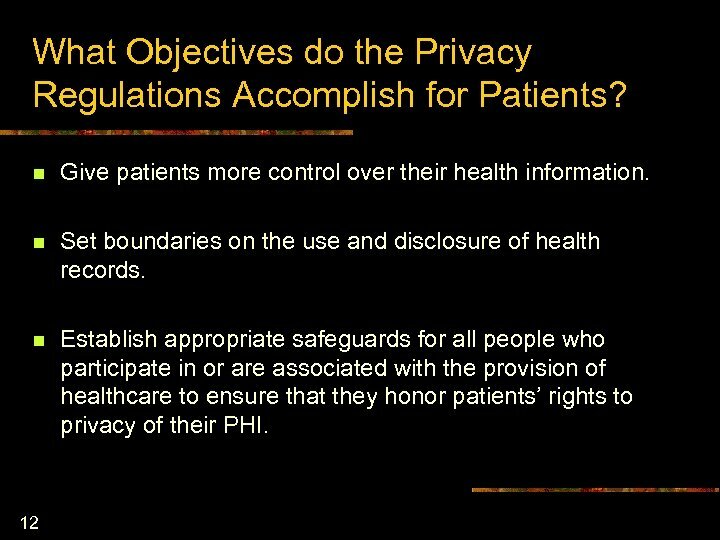 Recall that HIPAA gives patients the right to direct use and disclosure of their PHI. 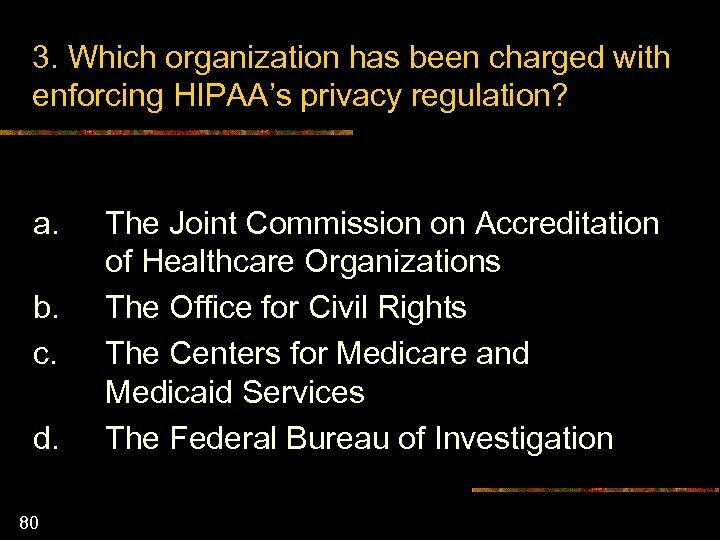 It is within her rights to have her name removed from the list. 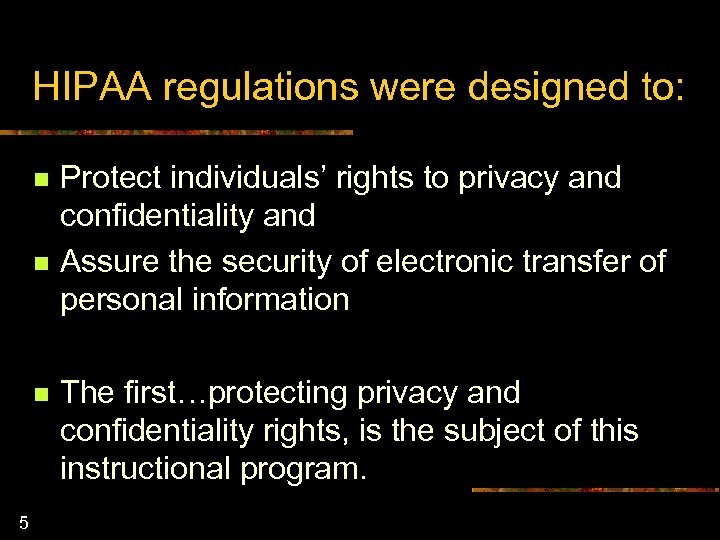 Most agencies will have special forms for this. 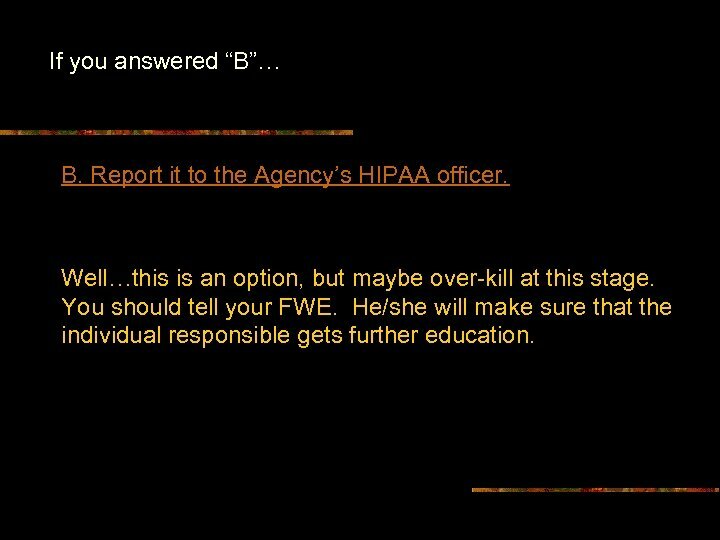 If you answered “B”… B. Reasonable; report it to your FWE. Yes, this is the correct response. 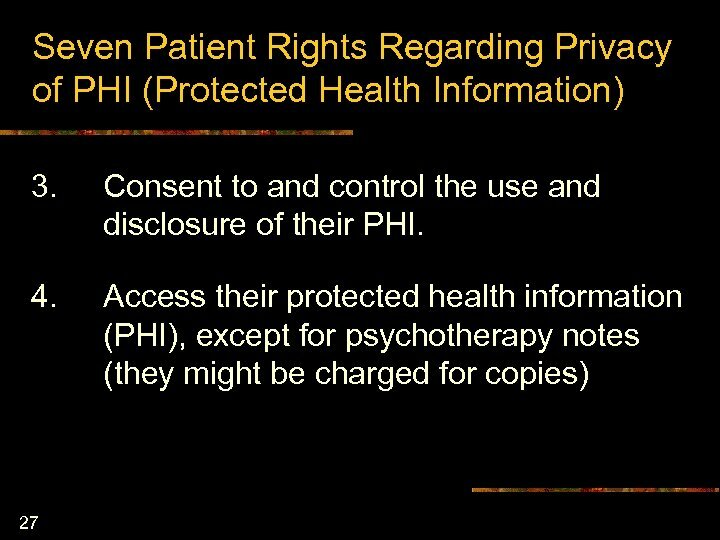 Recall that HIPAA gives patients/clients the right to control the use and disclosure of their PHI. It is within her rights to have her name removed from the list. As a student, report it to your FWE. 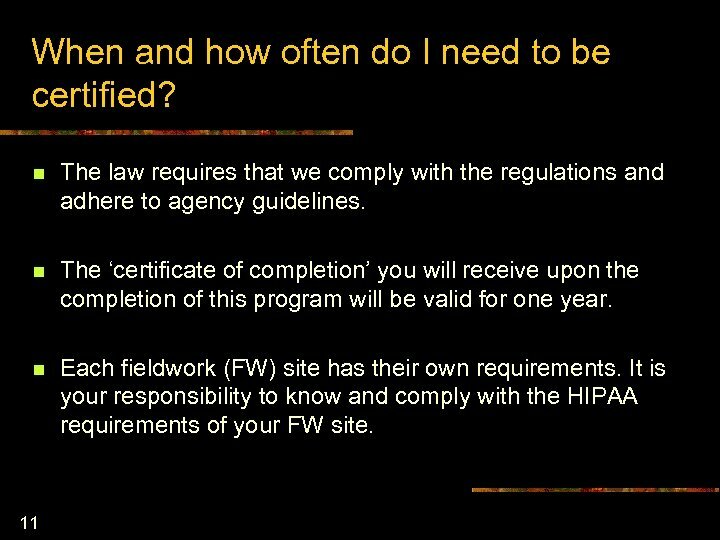 Most facilities have special forms for this type of request and your FWE will guide you through the process. 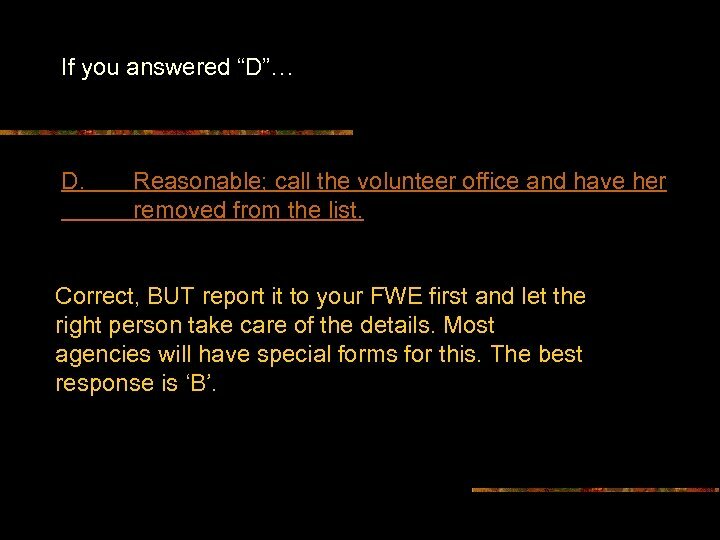 If you answered “D”… D. Reasonable; call the volunteer office and have her removed from the list. 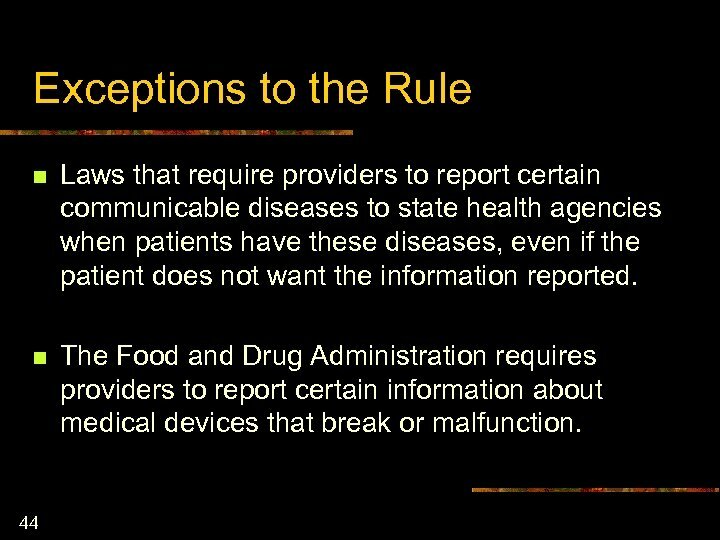 Correct, BUT report it to your FWE first and let the right person take care of the details. 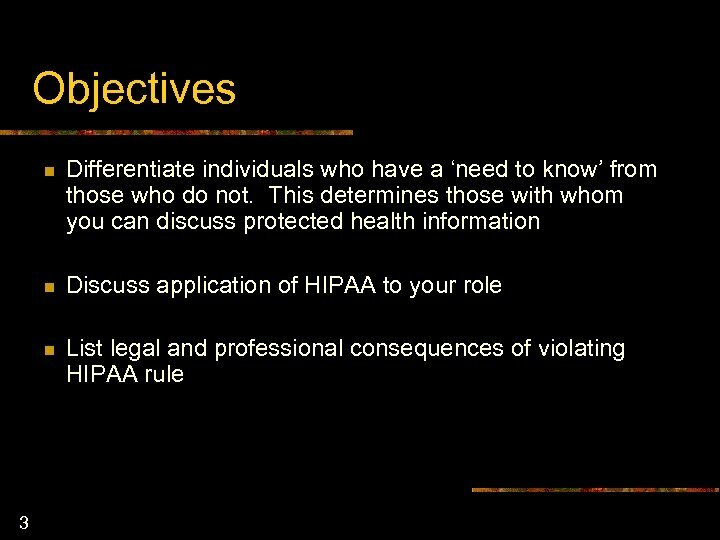 Most agencies will have special forms for this. The best response is ‘B’. 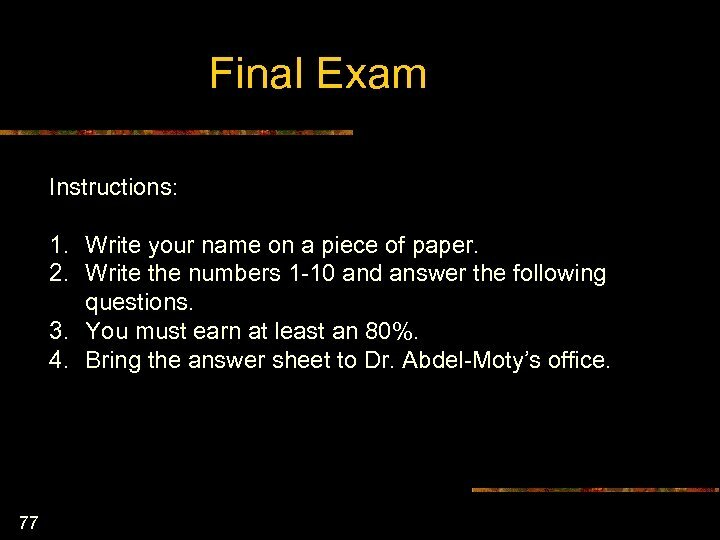 If you answered “A”, “B’, or “C”… Incorrect. 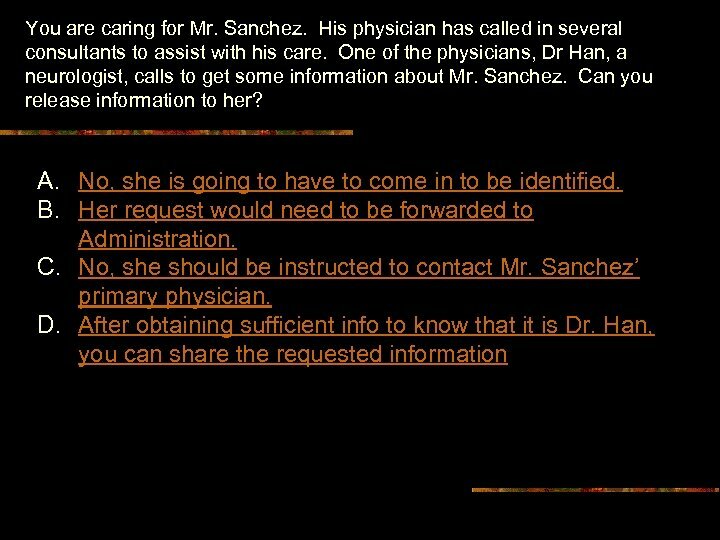 After instituting reasonable safeguards that it is Dr. Han, you should give her the information that she requests. 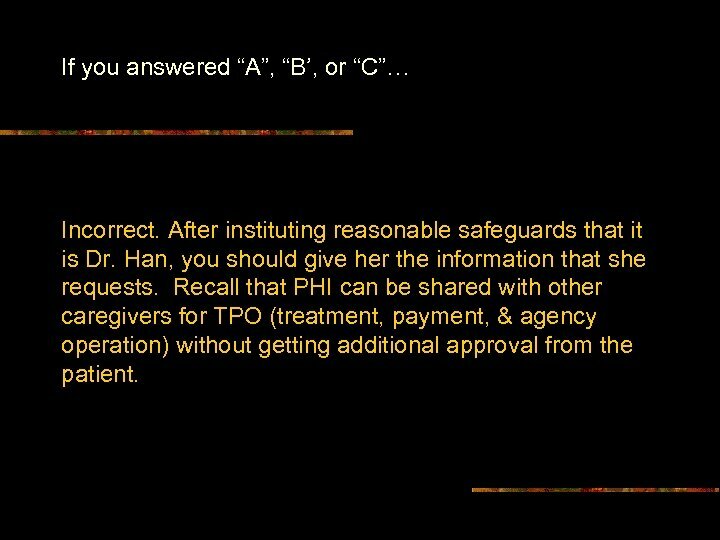 Recall that PHI can be shared with other caregivers for TPO (treatment, payment, & agency operation) without getting additional approval from the patient. 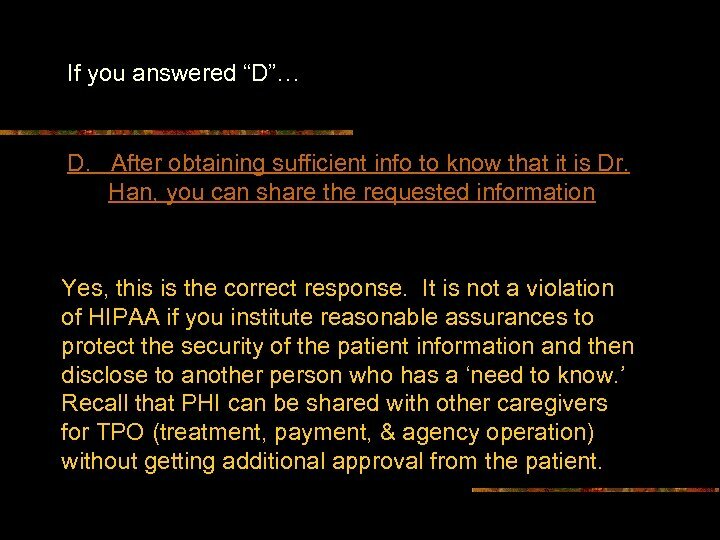 If you answered “D”… D. After obtaining sufficient info to know that it is Dr. Han, you can share the requested information Yes, this is the correct response. 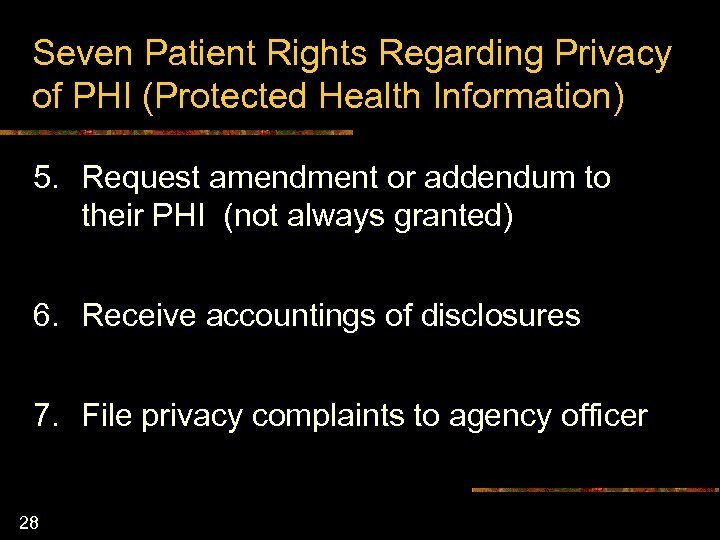 It is not a violation of HIPAA if you institute reasonable assurances to protect the security of the patient information and then disclose to another person who has a ‘need to know. 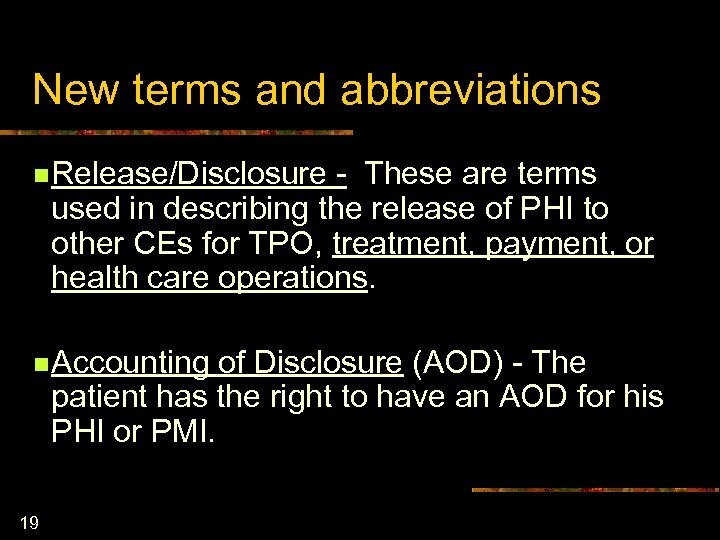 ’ Recall that PHI can be shared with other caregivers for TPO (treatment, payment, & agency operation) without getting additional approval from the patient. 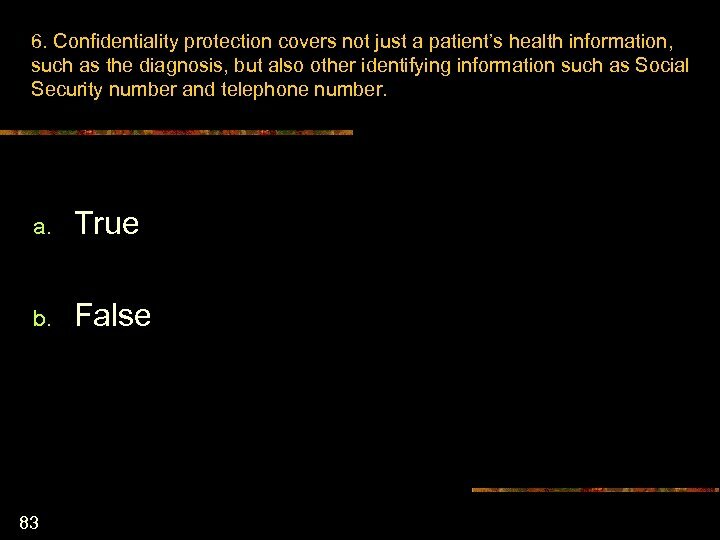 Answer n 73 Leaving a message with someone other than the physician that provides any identifying details about the patient or his condition is a breach of confidentiality. 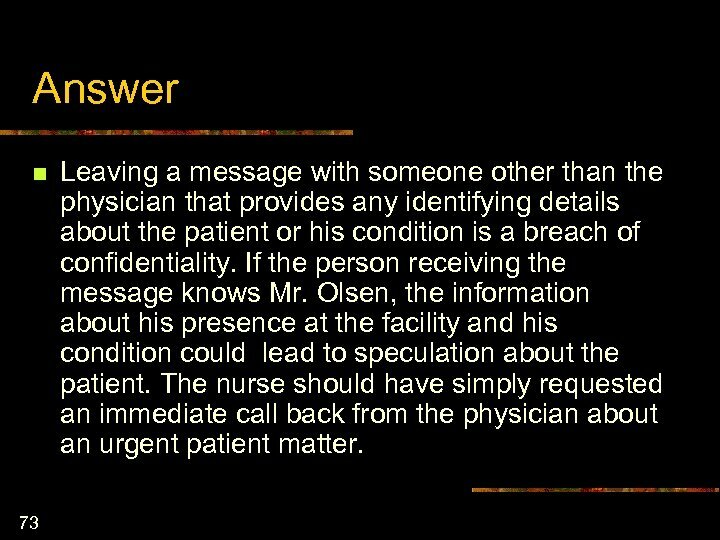 If the person receiving the message knows Mr. Olsen, the information about his presence at the facility and his condition could lead to speculation about the patient. 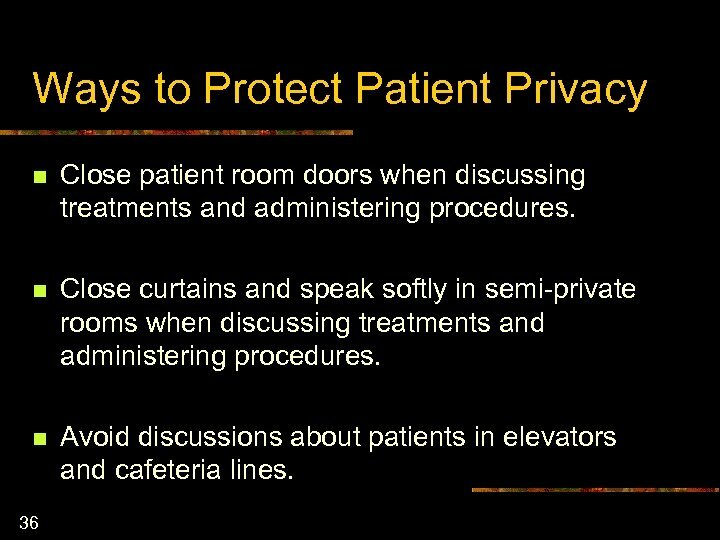 The nurse should have simply requested an immediate call back from the physician about an urgent patient matter. 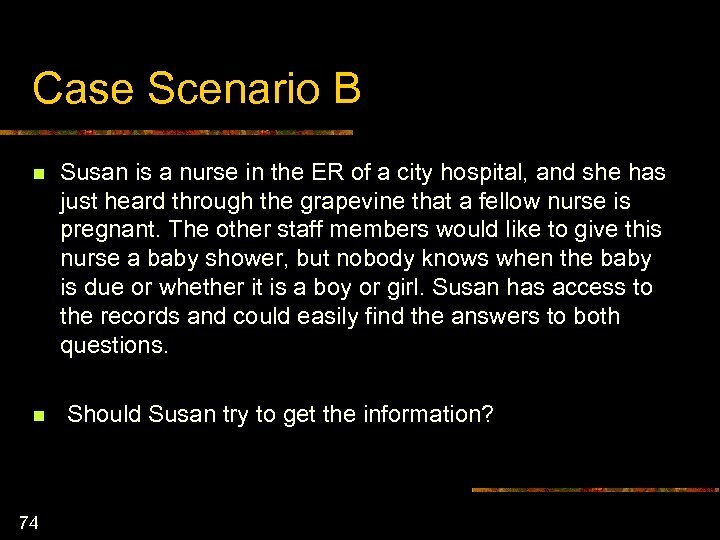 Case Scenario B n n 74 Susan is a nurse in the ER of a city hospital, and she has just heard through the grapevine that a fellow nurse is pregnant. The other staff members would like to give this nurse a baby shower, but nobody knows when the baby is due or whether it is a boy or girl. 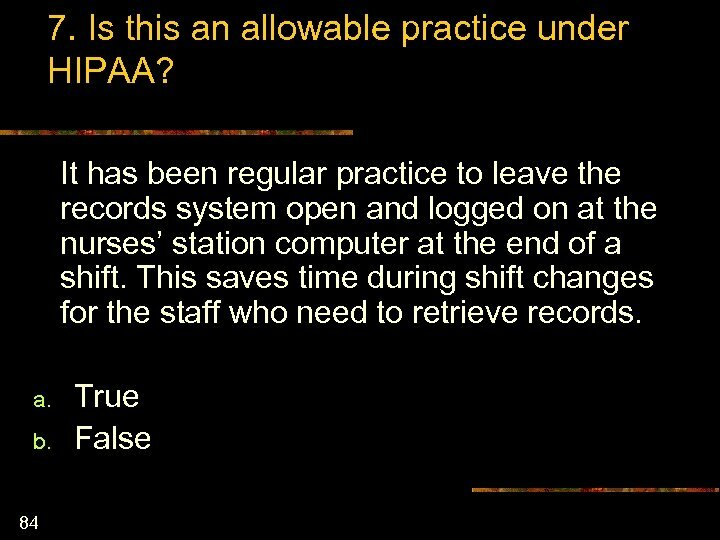 Susan has access to the records and could easily find the answers to both questions. 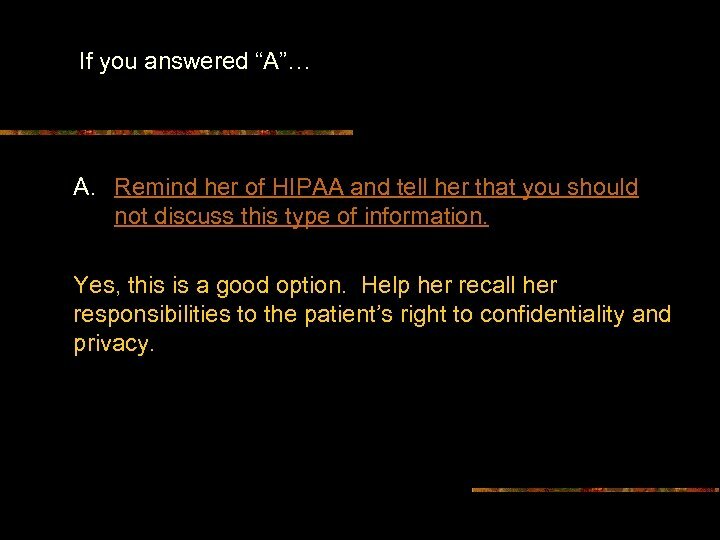 Should Susan try to get the information? Answer n 75 Absolutely not. 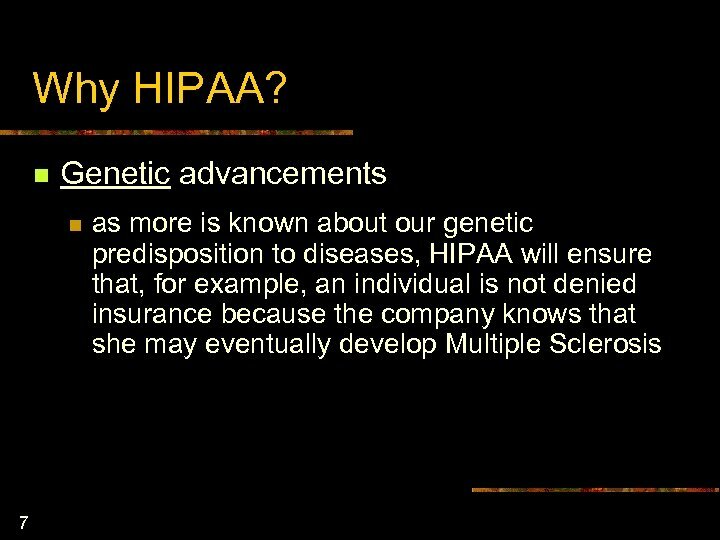 This is clearly an unauthorized use of medical information. 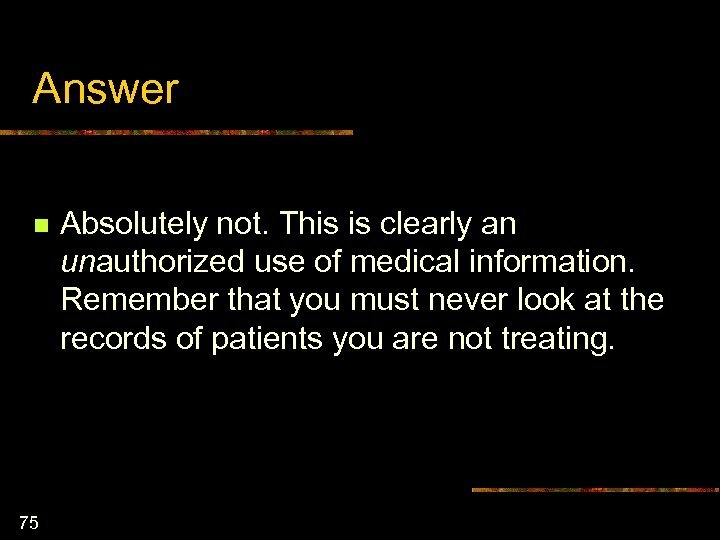 Remember that you must never look at the records of patients you are not treating.